Acezantez - Acezantez - OUT OF PRINT! 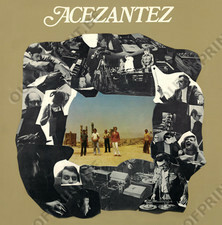 Rich textural pieces constructed from an unnotatable, intricate interplay of percussive squeals, scrapes and rattles, parched and pitchless woodwinds, and dislocated keyboards On the evidence here, Acezantez founded by the versatile Croatian composerand instrumentalist Dubravko Detoni merit wider recognition. Contemporary Croatian Masterpiece !